The Lindal Annual Dealer Conference was held in Seattle from January 17th to 19th with Lindal dealers worldwide in attendance. 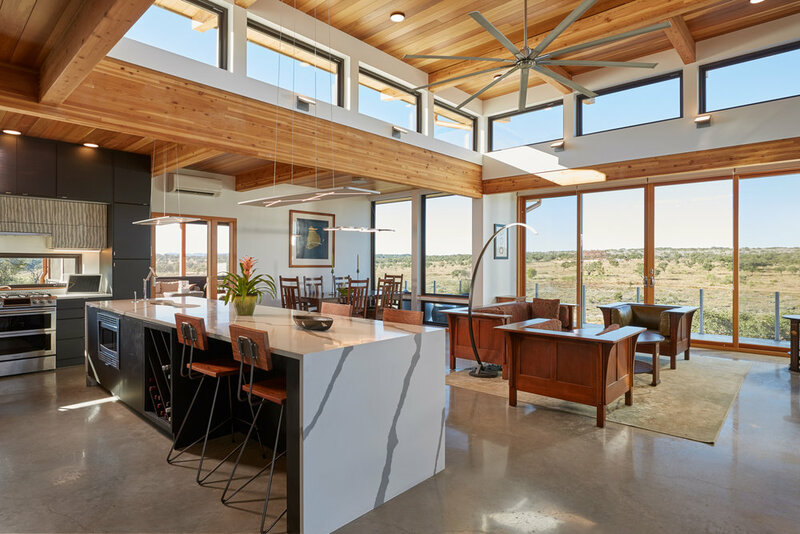 Three modern custom designed Lindal homes were showcased, confirming once again that no other producer offers the breadth of modern design capabilities and material options. David Vandervort Architects, a member of the Lindal Architects Collaborative, personalized their Vandervort 2270 design for clients from LA. 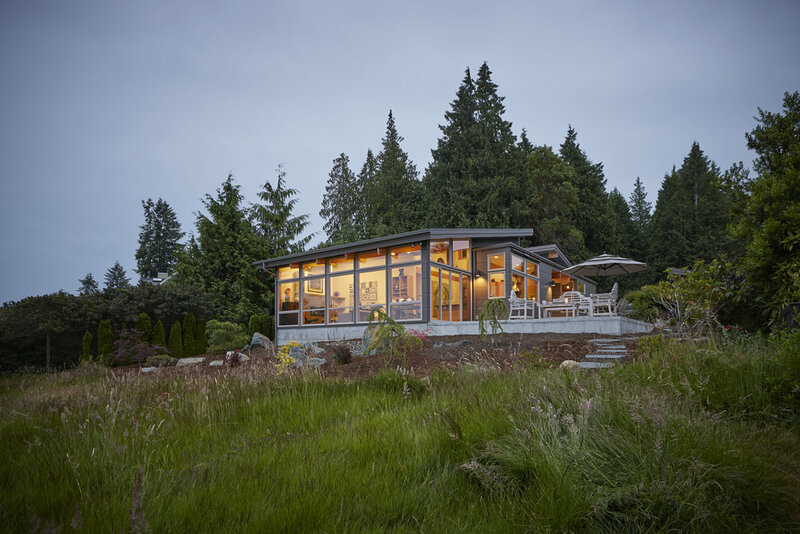 Sited on a windswept ridge overlooking Puget Sound, with views to Victoria BC to the west and Mt. Baker to the east. The home is clad in black steel that simulates board and batten siding with slightly recessed gable walls clad with black stained clear cedar , the long walls of the house are fully glazed in human scaled lutes of glass enabling a transparency through the house to the view beyond by day and allowing the house to glow like a welcoming beacon at night. Black steel columns replaced laminated fir posts and girder supports, inside and out, declaring a sense of strength and permanence in the punishing environment. Finally, flat roofed dormers admit light into the center of the house, denying the darkness of Pacific Northwest winter days. A Bulthaup kitchen and Design Within Reach furnishings complete the strikingly modern interior. 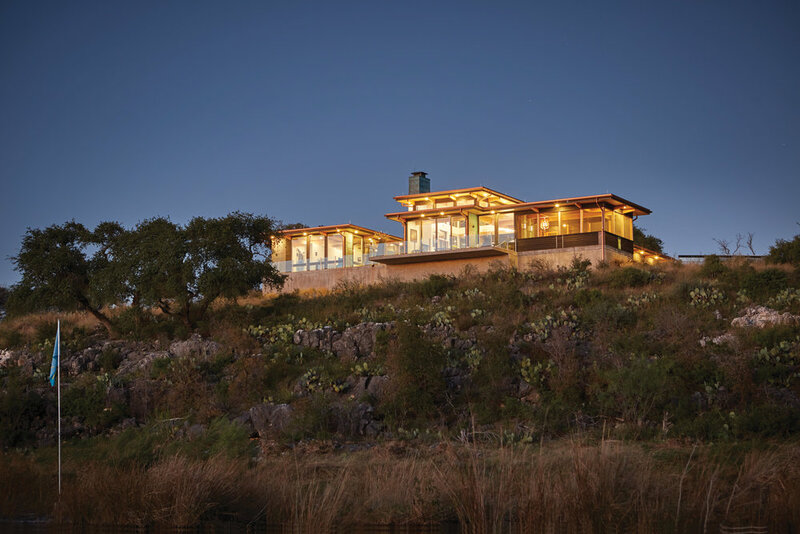 In the foothills outside of Austin, a spectacular one-level Lindal soaks in the semi-arid views. The interior also enjoys access to a private central courtyard, protected from sun and wind and extending the interior living space. A screened porch, open on three sides, provides a naturally cooled view of the foothills wildlife as evening falls.A 2800 square foot version of the smaller OM Hestia, this house is married to its site and detailed to the owners’ lifestyle, art, and pets. Black stained cedar enables the ground-hugging house to recede into the landscape, and acid-washed copper accents call attention to the entrance. On the interior, a comfortable mix of classic modern and up-to- date casework, fixtures and finishes create a comfortable and relaxing environment. 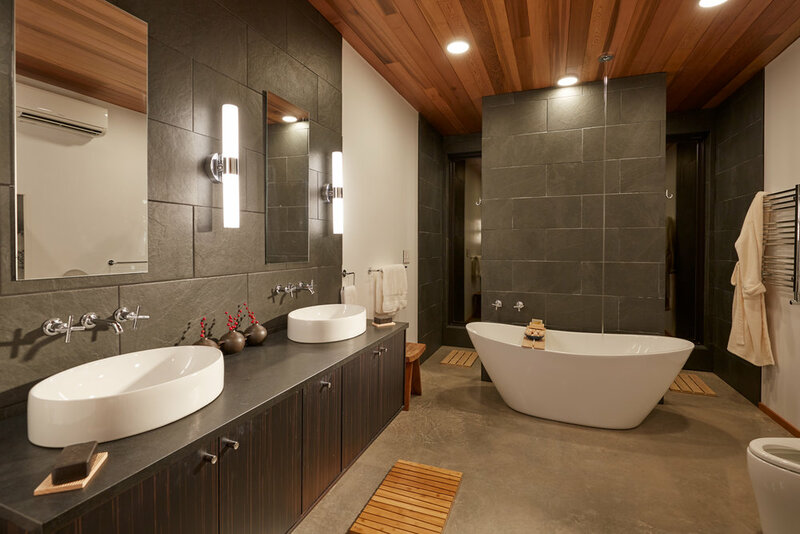 Polished concrete floors lend an air of informality and are easy to maintain. Expansive walls of glass including nine-foot high sliding glass doors, create a wonderful transparency. We are proud to be included in this triumvirate of modern custom houses. Atop a bluff overlooking Puget Sound, this custom Lindal is sited to prove a 25 foot wide view corridor (on a 65 foot wide site) that showcases the serene water view as one approaches the home and extends the interior living spaces on the sunny west side of the house. Designed for two retired educators and juried artists, the home is resplendent with regional art that competes happily with the far off horizon that follows one from room to room, uninterrupted. Two monopitch-capped volumes, clad in corrugated steel — one containing the great room and master bedroom, the other a private guest suite, home office and the artists’’ studio — are linked by a flat roofed entry gallery that opens onto Japanese garden. Flat roofed projections from the main volumes, clad with cementboard board panels, create intimate height interior spaces and enable water views from every room. The handsome Lindal laminated beams direct the eye toward the view and along with the fir trim create comfortable warmth to the interior. The Lindal annual awards banquet included a tribute by son Doug Lindal to Sir Walter Lindal, the company founder, inventor, entrepreneur, and legendary industry leader. The tribute traced Sir Walter's life from an orphanage in Ontario to the company home in Seattle. He created the Lindal post and beam system (obtaining over 20 patents in the process) that we continue to refine and modernize today. Warmmodern Living was recognized as Lindal's #1 dealer worldwide with projects in Washington, New York, and California — a record year for us. 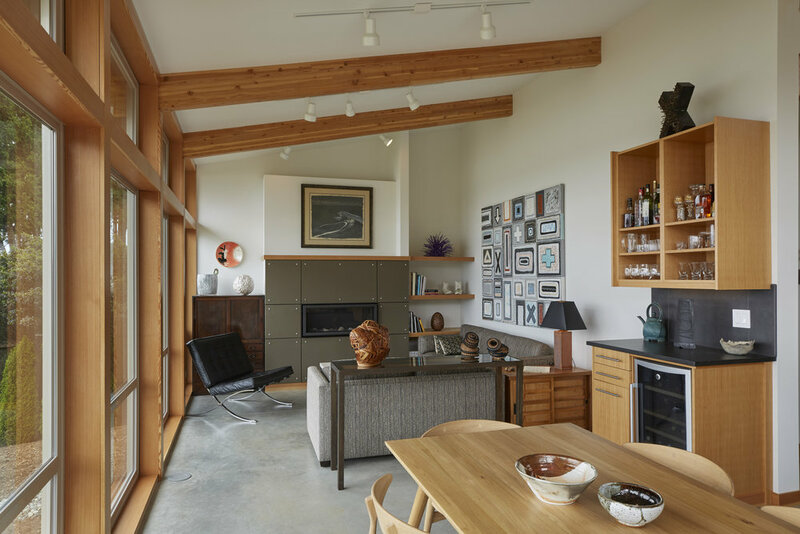 The meeting’s celebration of Lindal Modern was particularly gratifying, given the fact that we led the development of Lindal's modern design program, Lindal Elements, and the Lindal Architects Collaborative a decade ago. Lindal Modern now accounts for over half of the Company's production as companion to the Lindal Classic designs that are still popular in many markets worldwide. The home of a lifetime created just for you.